Native Flok are an upholstery service producing soft furnishings, interiors, props and a variety of bespoke commissions using traditional and modern upholstery practice. Native Flok is based in Albion Studios. Native Flok are happy to work with bespoke one offs or sample production. They work with a range of clients from private clients through to artists and designers. Native Flok are particularly interested in collaborating with independent textile designers, jewellers, weavers, printmakers and illustrators. Project Specific - Depends on project and requirements. 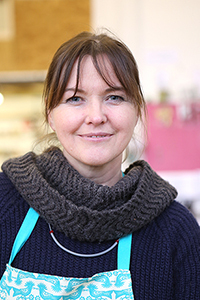 After Eve graduated from the Association of Master Upholsterers and Soft furnishers she set up Native Flok so that she could apply her skills to design led upholstered projects. Eve is particularly drawn to textile design and arts based sculptural structures using traditional and modern upholstery practice. Eve is inspired to develop her skills further by working on interesting and challenging projects in creative industries.